The mundane international break got over and our beloved Premier League football was back this weekend. 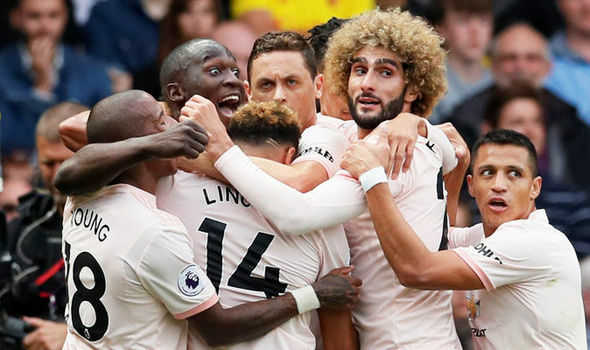 Manchester United, after two back to back defeats against Brighton and Spurs, had beaten Burnley but the untimely international break had halted the momentum. The match at Vicarage Road was a huge test for Jose Mourinho and his men. Watford, fresh from a come back win against Spurs, were full of confidence on Saturday as they chased a fifth straight win in the Premier League. It wasn't going to be easy for United as Watford had given United a tough time in recent years. Although United had won 5 of the past 6 meetings, the Hornets gave United a scare in each of those five wins. Jose Mourinho had made one change to the starting XI that beat Burnley 2-0 as Ashley Young came in for Luke Shaw who got injured on England duty. Vicarage Road was bouncing as Troy Deeney and Antonio Valencia lead the team into the ground but it were the men in pink who started the game brightly. Alexis Sanchez and Jesse Lingard looked sharp as they tried to break down a solid looking Watford defense. Etienne Capoue was even booked on the half-hour mark after he fouled Jesse Lingard on a United counter-attack But from the resulting free kick, United took the lead. The ball was floated into the penalty area and found Fellaini on the far post. The Belgian put the ball across the six-yard box but the home team cleared it away. The half-hearted clearance fell to Ashley Young put a dangerous ball into the box and Lukaku bundled the ball in the back of the net. United had their lead doubled when a Chris Smalling smashed in a fantastic left-footed volley into the top corner. A set-piece routine from the training ground found the chest of Fellaini who controlled it brilliantly to set up Smalling. Paul Pogba, who was sensational in the first half, almost had the chance to finish the game off on the 45th-minute mark, only to be denied by Ben Forster. Watford had a few moments of their own in the first half as well, most notably when Troy Deeney forced a brilliant save from David De Gea. But apart from that, they kept crashing into Marouane Fellaini. And the big Belgian repelled them all night. Be it with interceptions or tackles or long balls, Fellaini was everywhere to help Smalling and Lindelof. Watford, who came back from behind to beat Spurs, started the second half with more desire than the Red Devils. Soon the pressure paid off as Andy Gray smashed the ball into the top corner from a Abdoulaye Doucoure cut back. To say that the next 25 minutes were nervy for Manchester United would actually be an understatement. Anthony Martial was subbed in to stretch Watford's defense but the Frenchman failed to capitalize his chances on the counter-attack thus allowing the Hornets to press United till the very last minute. Nemanja Matic was sent off in the last minute of injury time for a second bookable offense as he fouled Hughes on United's left-hand channel. Hughes swung a dangerous free-kick into the box and even found the head of Kabasele but United were saved by an otherworldly save from the best in the world. It was save that literally gave United all 3 points from the match. United now have 9 points from first 5 games and welcome Wolves in the next Premier League match. But before that they have a trip to Switzerland to face Young Boys in the Champions League group stages. September and October will prove to be very important for the club.